What are the grow equipment advantages to having a light mover with a 4×4 grow tent? And, how does this grow room design work with such a small grow tent? Is having a light mover with a 4×4 grow tent really needed? Here is the thing to know with a small grow tent. And, it is the same principle to know for any sized indoor grow setup, really. A light mover with a 4×4 grow tent eliminates the intense canopy heat and allows the plants to be closer to the grow light. So, we get a better quality grow light interaction and our plants thrive in this small grow tent environment. Each grow tent size will have its own challenges for the grow room design. And, that is typically the grow tent vertical height limitations. Another grow equipment detail to overcome might be getting rid of the heat in the grow tent. But, for the 4×4 grow tent, we still have these factors. And, we have the additional challenge of having a small grow tent. So, a huge step in the right direction will absolutely be the light mover with a 4×4 grow tent. Using a grow light mover should definitely be an integral part of how to set up a grow tent. And, that’s because it’s integral to the success of that grow tent. Here is how that works. A light mover with a 4×4 grow tent eliminates the intense hot spot off of the canopy. No, we can’t move the indoor grow light very far. But, just moving it a few feet makes a huge difference in our indoor grow system results. And the truth is, our grow light system should never move very far anyway and here is the reason. Plants do best when the indoor plant light is intensely overhead and then moves off-side slightly, and then is intensely overhead again. That grow light system pattern actually gets the plants to open their receptors more. And to the opposite, if an indoor grow light beats down on the canopy in a stationary way, the receptors would close more. Then fewer leaf areas would be working for the good of the plant. This grow tent science is actually the same grow room design science that’s a constant for any sized grow tent. Even with the largest commercial grow room design plans; we know that moving grow lights are ideal. When we move our indoor grow light in our grow tent, we not only get rid of the hot spot, but we also get rid of the shadows. So again, more leaf surfaces are now benefiting from our plant grow light. Plus, even though we are challenged with our vertical growing systems limited height, as the plants grow we see this. Our canopy can get much closer to the grow light system. So, because it moves on a LightRail light mover; that’s the very reason we can get closer. And, we’re closer to our grow lamp without the burn because of that important detail that our plant grow light is moving. What about the small grow tent sizing and the light mover rail? How does a light mover with a 4×4 grow tent even fit? It actually fits perfectly into the 4×4 grow tent. And, how we do this is we use a half rail. With the LightRail light mover indoor grow kits, the rail comes in two slide together sections of one meter each (3’3”). This is true with the LightRail 3.5 Kit and the LightRail 4.0 Kit. Combined, they would make two meters (6’6″). So, we use just a half grow light mover rail and we are good to go. 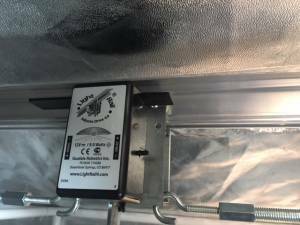 In addition, Gualala Robotics manufactures special LightRail light mover grow tent hangers that make it easy to hang the indoor grow light of our 4×4 grow tent onto our grow light mover. A light mover with a 4×4 grow tent is a serious asset. The advantages to our indoor grow system are huge when we move our grow light system. So, one quality grow lamp moving in the 4×4 grow tent makes all the difference for grow tent outcome. And, whether it’s an LED grow with a quality LED grow light in place, or whether it’s a plasma grow light, a LEC grow light or a de grow light, we see this. Our growth rate is faster and our yield numbers go way up when we make the simple change to using a grow light mover. That’s how we can best maximize our grow tent results. And, that’s the best way we have to overcome the challenges of a small grow tent.